Many mammals spend all or most of their lives underground and must dig in order to food, create shelter or move about. These borrowing or ‘fossorial’ species cut into the ground using the incisor teeth and or claws. The large, razor-sharp incisors of rodents are particularly well suited to this task as they grow continuously to compensate for heavy wear. Those species which use mainly the feet to dig have well developed claws and skeletomuscular development adapted to the production and active transmission of powerful forces. Furthermore, burrowers generally have a compact and rounded or cylindrical body shape. Fig. 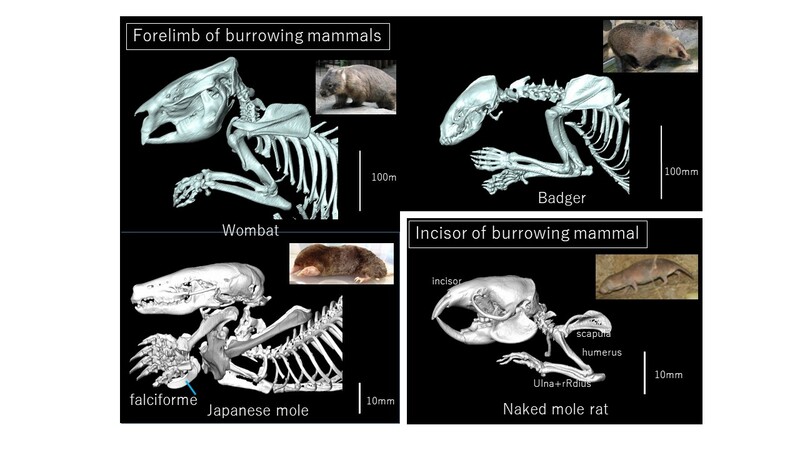 31 The skeleton of incisor (Naked mole rat) and forelimb (wombat and Japanese mole) of burrowing mammals. Moles are highly specialized for underground life. They have an elongated, cylindrical body covered in dense, velvety fur with no obvious nap, allowing them to move forward and back in a tight space, without having to turn around. The eyes are small, with limited visual acuity. Most importantly, the short, powerful forelimbs are superbly adapted for digging. The hands are large and turned permanently outward and the digits are equipped with strong claws. When burrowing, a mole performs synchronized movements of forelimbs to excavate soil and shove it behind the body. 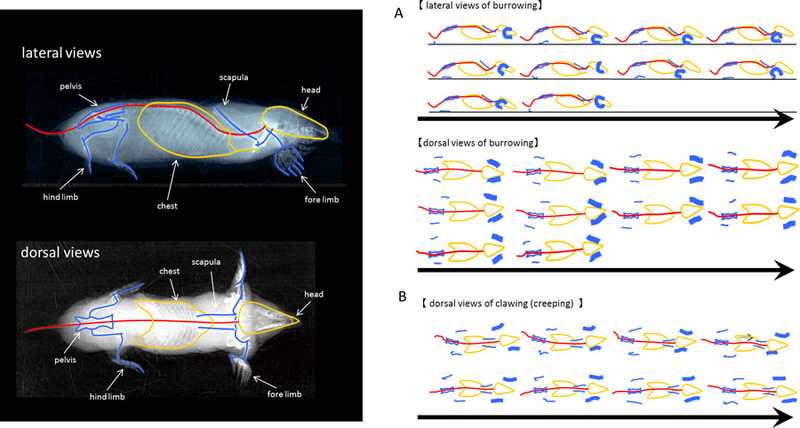 When crawling or swimming, the mole switches to alternate movements of the limbs on either side of the body(ref.5).